How can you reach 1bn AUM? It is with great excitement that we can finally release a sneak peek of our “Making it Big” report. This collaborative report with GPP and AIMA provides insights from larger, more established managers who blazed a trail in building a billion-dollar hedge fund business. The research examines their path to growth, providing a roadmap for both emerging and start-up managers. Key features of this paper include capital raising and how best to do it, the optimal business structure for the growing hedge fund manager, as well as other critical aspects an emerging manager should consider to implement as they develop their business. 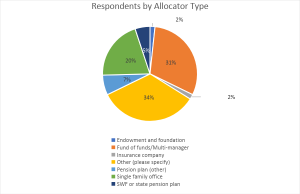 Hedge fund representation includes respondents from the emerging manager group, making up 65% of the total, and the remainder coming from managers of funds with over $500m AUM. This includes managers who run funds over $1bn AUM. Crucially, the research also reflects the opinions of hedge fund allocators, accounting for approximately $85bn. We discovered that managers should try to identify opportunities to punch above their weight and look to get the right personnel on board at the earliest opportunity. In short, if they aspire to be a billion-dollar business, they need to act like a billion-dollar business. To achieve the key milestones on the road to a $1bn AUM they need to be flexible and constantly keep the investor in mind. Instilling trust through transparency, investing their own money in the fund and maintaining working capital levels on the way to $1bn AUM were shown to be crucial. Implementing marketing and communications strategies that actually work were highlighted as essential. Identify opportunities to punch above your weight. Funds that successfully surpass the $100m AUM barrier open themselves up to a greater field of opportunities to receive capital investment, and the array of allocators who can invest in them increases. Seed funding offers an effective way of accelerating the growth of a smaller fund. With larger funds typically possessing specialist staff such as experienced marketers, seed capital offers smaller managers the ability to make additional hires and work on further growth plans. It also provides the fund with working capital to cover overheads and the ability to be more flexible than competitors. Established funds appear to rely heavily on face-to-face marketing and personal networks for successful fundraising. Consistent with this observation, results revealed those managing between $500m and $1bn sourced none of their latest investments from third-party marketers, preferring instead to use their own personal networks and existing client referrals. This suggests marketing specialists at smaller firms should concentrate on continually increasing their industry connections to galvanize interest in their funds. Allocator responses also confirmed this finding, citing the effectiveness of their personal networks for sourcing investments. Of critical importance to investors was meeting a fund’s key founding partners and portfolio manager, and then maintaining that access during and after the investment process. Growing funds could benefit from producing quality marketing materials and communicating with allocators, who were shown to actually read the content they receive. Combined with this, by offering allocators transparency around their strategy, approach to risk and correlation to the market, smaller funds could mitigate the effects of a short track record. This was confirmed by 58% of respondent allocators. According to 44% of allocators, greater transparency and access to the portfolio manager for information were also shown to be ways an emerging manager can overcome a short track record. Responses suggest it is essential that the manager invest their own money in the fund. Allocator respondents want the certainty that they are investing alongside the manager and that gains and losses are felt by both parties. Respondent managers running funds with less than $100m holds on average 7% of their funds’ assets. Those with more than $1bn under management were shown to hold on average 4.6%, offering a useful benchmark for the emerging manager to keep in mind. The possibility for a fund to break even with $86m AUM was a unique finding of last year’s Alive and Kicking research and this overall average figure remains relatively static at $85m in the current results. However, new insight from funds with over $1bn AUM revealed a requirement of $180m AUM to break even, offering useful intelligence for the future $1bn manager. The fund breakeven point exhibits significant variation when analyzed across fund strategy, AUM size, and geographic location. A global macro fund with less than $500m AUM appears to show a breakeven value over four times higher than a multi-strategy fund managing over $500m. Smaller North American funds appear to breakeven at half the AUM value of their UK counterparts. The results offer growing managers a picture of the idiosyncrasies of their fund types and invaluable insight into the experiences of established funds, who made salient the critical importance of having enough working capital to support two to three years of sub-scale AUM. 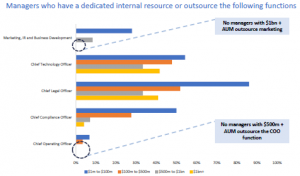 Results revealed the importance to larger funds of possessing particular senior in-house staff, showing emerging managers what to plan for as they grow their AUM. The COO function appeared to be an inherently important internal role during the launch and growth phases, being the least outsourced by all sizes of a fund. A discernible inflection point was observable once funds breach the $500m AUM mark when the roles of Chief Legal and Compliance officers are brought back in-house. Funds managing between $100-$500m and those managing over $1bn all hire an in-house marketing specialist. This observation is significant, as other results suggest successful fundraising and network building now rely heavily on good, face-to-face communications and awareness strategies. Follow this space, or our LinkedIn profile, closely for more upcoming information on this report. You can also join us in our newsletter here, to receive it directly in your inbox.